Given fast-moving events in northern Iraq these past few weeks, the prospect of an independent Kurdistan emerging from the rubble looks increasingly likely. For the Western powers, there are several good reasons to support an independent Kurdistan: the region would likely be a relatively well-governed, stable, pro-Western ally (Amitai Etzioni makes this argument in greater detail elsewhere on The Diplomat). However, for China, which has remained tight-lipped mostly on the sidelines of this conflict so far, an independent Kurdistan could be a step too far. Since Mao and the Communists united China in the 1940s, a mainstay of Chinese communist foreign policy has been an opposition to separatism at all costs. Beijing does this not only due to its own Taiwan situation, but also because of fears that witnessing successful separatist movements elsewhere in the world could galvanize separatism in Xinjiang, Tibet, and Inner Mongolia. Beyond mere philosophical opposition to an independent Kurdistan, China has important economic stakes in the region. Since 2009, when Sinopec acquired Addax Petroleum, which was developing the Taq Taq oil field in Iraq’s Kurdish region, Kurdish Iraq has become a major economic nexus for China. In recent years, Chinese investment in Kurdish oil fields and infrastructure has been rising rapidly, and several hundred Chinese citizens live and work in the region. 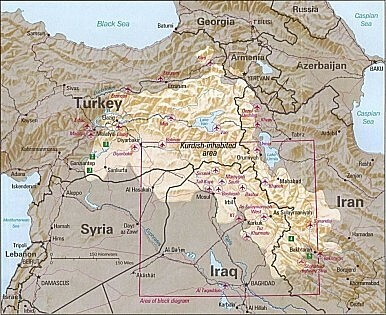 Following the United States’ 2003 invasion of Iraq, the Iraqi government formalized Kurdistan’s post-1991 high degree of autonomy within the Iraqi state, allowing the region to effectively conduct itself as a state (i.e. set its own foreign policy, manage its own defense, etc). The reason the region isn’t a country yet is because of a convoluted oil-sharing agreement between the government in Baghdad and the Kurds. One can imagine a situation where Beijing permits the emergence of an independent Kurdistan, but remains rhetorically opposed as it does so. In such a scenario, Beijing would reap the benefits of continued economic cooperation with Iraq’s Kurds, access to northern Iraq’s bountiful oilfields, and still come off as appearing as “hard on separatism.” Given the trajectory of current events in Iraq, including the Western intervention to stop the progress of ISIS, it looks increasingly likely that China will have little say in the final outcome of Kurdish independence. Additionally, while the Kurds are under threat from ISIS, they could end up emerging from this crisis with a major ace up their sleeve: Kirkuk. Kirkuk sits on 10 billion barrels of oil and should it come under autonomous Kurdish control, it could embolden the Kurds to finally declare independence. The status of Kirkuk has been a constant issue between the Iraqi government, which claims it is outside of Kurdistan in the interest of keeping the oil revenue from the fields there, and the Kurds, who claim that it is a part of Kurdish territory. What makes Kurdistan different from Kosovo and other separatist movements is that China has strong economic stakes there. So far, China has been able to do business with Kurdistan without having to implicitly back the Balkanization of Iraq. Depending on how the current conflict with ISIS plays out, Beijing might find that its national interest is best served by backing an independent Kurdistan.